Welcome to the team, Derruis ! Hope you have EVEN GREATER success than the last offensive Derrius that we drafted !! Not pretending to be an expert but with my layman's eye was watching multiple games with coaches tape. Zoning in especially on Kelley and Perine. I was looking at things with Cooley and Portis' take in my mind. Cooley's thing is that our TE blocking stinks but regardless our RBs constantly miss holes and in his mind their instincts aren't that hot. Among Portis' things is good NFL running backs see the holes quickly, are decisive, can plant and cut and shift directions quickly and can get skinny in the hole. And things don't go according to plan often so they adjust. Both Perine and Kelley I notice follow their blocks but it looks like too often don't adjust to what the defenses are doing and don't have quick feet-cutting ability. Kelley has some moments from the games I rewatched but not enough of them. On this play, Perine has an opportunity to cut up right the middle and a half second later a big hole opens up on the right, too. The bottom screen doesn't show it well enough but there was also plenty of room to skirt on the outside for a decent gain, plenty of daylight. 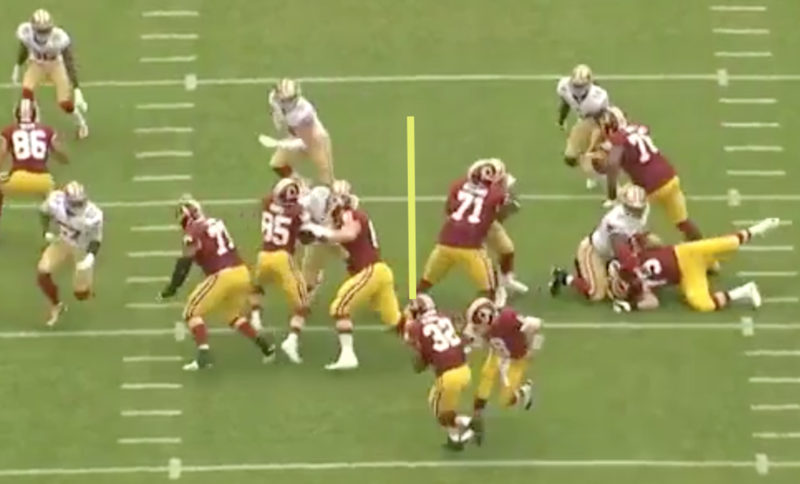 Instead, Perine follows his blocks on the left even though its crowded with 49ers defenders and gets almost no gain. If you zero in on Perine in particular in some games, these type of plays aren't that uncommon. Granted the dude is a power runner. But I think with better vision he can do better on some of those short distance runs where he was surprisingly stopped. Putting this on the Guice thread because Guice does get skinny in the hole, has good vision, On this play, I bet he would have seen the hole or trusted his speed to run around the defenders on the left. I am not saying Guice is the be all and end all but I think having great vision, quick feet, ability to break tackles and 4.49 speed versus the Perine/Kelley 4.65 speed -- I think will make a major impact. The infamous 3rd and 1 play in NO that arguably sunk the season. That one was difficult. 11 on 11 right on the line of scrimmage you don't see that all the time. So really no holes on that play unless you dart to the outside. Though my arrow points to the daylight if he darts quickly in that direction, he had a window albiet a small one. Perine ultimately cuts just to the left of Niles Paul and gets slammed down by the defender. Only shot on this one it looks like was to skirt quickly to the outside to the right. All he needed is one yard. If you got a back with some speed and good vision they would have likely made it. Guice? Ironically I think if Thompson was in on that play instead of Perine they would have made that first down and perhaps saved the season. Sadly, as we know, Thompson got hurt earlier in that game. Though granted their alignment might have been different to defend Thompson. Yeah I think he's all right as a back up. But I don't think you can teach vision, either you got it or not. Short speed -- either you got it or you don't. I am just pointing it out for those with the theory that its all about bad run blocking on the team. Rewatching some games, I think a chunk of the problem are the actual backs. I don't think its a coincidence that Chris Thompson actually has a good YPA with the same O line. Not arguing your actual point (I agree with it), but I wonder how much of Thompson’s yardage came via draw plays and such in semi-unexpected situations for runs. But yes, Thompson’s a more talented back. 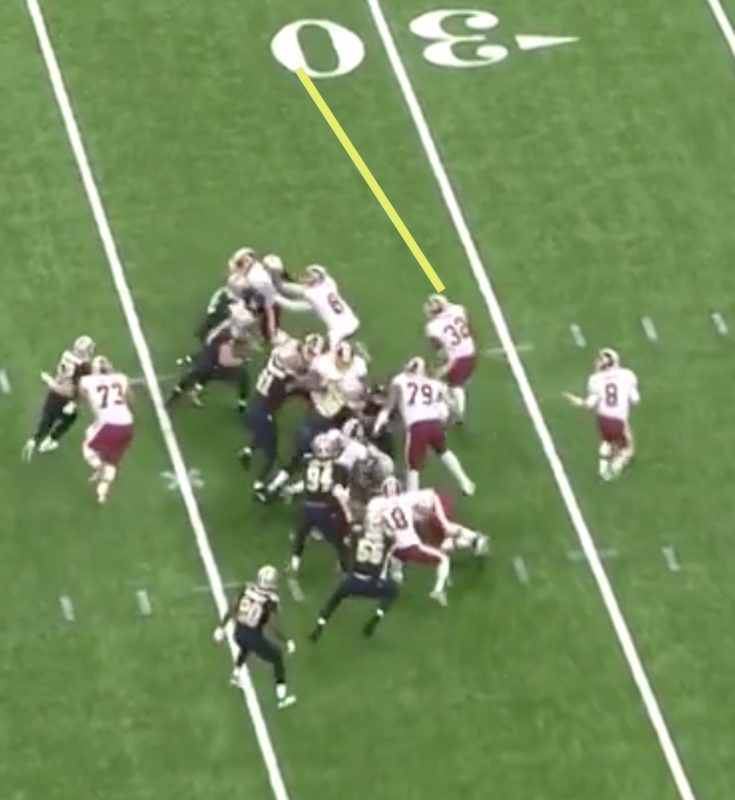 My hope for Perine is that he struggled balancing the difference between the zone and power run plays (on top of worrying about fumbling), and was also stuck behind a pretty injured/horrid oline. Essentially, that he was overthinking things. IIRC, h seemed to run a bit better later in the season and later in games. The run blocking isn't great but our RB talent is crap. So many times there are big holes they never see or hit too slow. Guice can run for 1k+ easily behind this OL and that's with the bad TE blocking and black hole at LG. I see him either being a rookie pro bowl top 3 RB in the league or completely busting, No in between for this guy. With that kind of confidence/swagger/cokyiness it goes 1 of two ways, Superstar or Bust. Agree its easier to run sometimes on third down when no one expects it but you can see Thompson has vision, quick feet, can cut and accelerate fast. Stud. With Perine, the obvious vibe is that his strength is wearing down defenses with multiple carries, he's a tank and there is some value to that. He has decent hands, too. so I am not down on Perine as a backup. But I wonder about his vision and he doesn't have quick cutting ability so I think that limits him. For a big guy, he got stuffed too often in key short distance downs. The dude is so solidly built though if you have to keep tackling him, he will eventually wear you down. But for a big guy, to me he's not that hot in these 3rd and 1 and 4th and 1 situations where everyone knows he will get the ball. I think Guice will be an immense improvement. Watching the play over for example against the Saints. The Saints load the box -- and mostly tight between the numbers. The Redskins counter with their heavy set. All men on deck on both sides of the ball. You don't see that too often. 11 on 11. You give us your best shot and we will take our best shot. On that one, Perine didn't have long to make a decision but he decided to run into the wall versus run around their wall. Looking at that play in slow motion, his only shot was to run around that wall. Maybe he didn't think he had that speed to do it but I think he could have. Jay said later he'd love to have that call back, I see why. Kirk probably could have faked a handoff with Perine on the right and then scrambled to the left. I agree...in fact, I don't see him making the roster this year. In fact, he and Kelley could both be in trouble if the kid from Grambling is as good as some think he could be. That being said, I'd take Kelley over Perine right now. Guice lines up only 5 yards behind the LOS. That SDSU RB, Penny was 7yds deep. It takes him longer to get to speed. But Guice hits the jets much faster. That should be a significant advantage to our OL run blocking. Without his 61-yd TD off a draw, Thompson averaged 3.7 ypa. A big play removed will lower YPA in a small sample size (Thompson arguably more of a passing threat than running weapon last year) but its not like this is the first rodeo for Chris Thompson. If we enlarge his sample size for his whole career, his numbers are even better. 5.2 YPA. IMO the dude runs with better vision -- much better cutting ability, quicker feet than Perine. While our O line could certainly be better, it hasn't exactly stopped Thompson in his tracks. I am not trying to kill Perine. Got no beef with the dude. But I don't think its a coincidence that both Doug and Jay in the off season emphasized at times in a heavy handed way, we got to improve the running game and get a back. I figure if they thought LG and TEs are more responsible for the lack of the running game last year than the actual running backs -- then Doug instead of talking up how we need a running back, would be talking up LG with that same urgency. Not saying you are on the other side of this position -- just explaining mine. And I'd love a better LG and blocking TE but my gut is even if we got them, we'd want an upgrade over Perine/Kelley. IMO the dude runs with better vision -- much better cutting ability, quicker feet than Perine. While our O line could certainly be better, it has't exactly stopped Thompson in his tracks. I am not trying to kill Perine. Got no beef with the dude. But I don't think its a coincidence that both Doug and Jay in the off season emphasized at times in a heavy handed way, we got to improve the running game and get a back. Speaking of Thompson, is it expected that he could have lost some of his speed or other skills permanently, due to the last injury, even though he technically reaches 100 % ? I was just looking at Perine a little bit closer -- to go with the theory that to maximize him you got to have him wear down defenses. in the last 4 games where he played (included the few carries in the last game, too) -- give or take around 15 carries a game. He averaged 2.8 a carry. His two best games were before that. Back to back NY Giants-Saints game. Got 20 plus carries. He averaged 4.6 a carry in those games. I see Perine as a guy that can just wear you down over time. But he's not the dude that I want on the field on 3rd or 4th and short because I have my doubts he will find the crease or has the speed to dart to the outside for a gain if the inside is too congested. I don't think Perine will ever be better then a good backup or at best a league average starter. His lack of vision is startling but he also has bad balance and lets easy contact bring him down too often. He doesn't maximize runs. If an OL gives you a 4 yard run, Perine will get you 4, maybe 5. Guice can get you 8 or 9. In the long run, that adds up, and that isn't even factoring in Perine's big play/explosive ability. I'd be okay with getting rid of Perine AND Kelley and rolling with Guice, Thompson, and that kid Capri Dibbs. 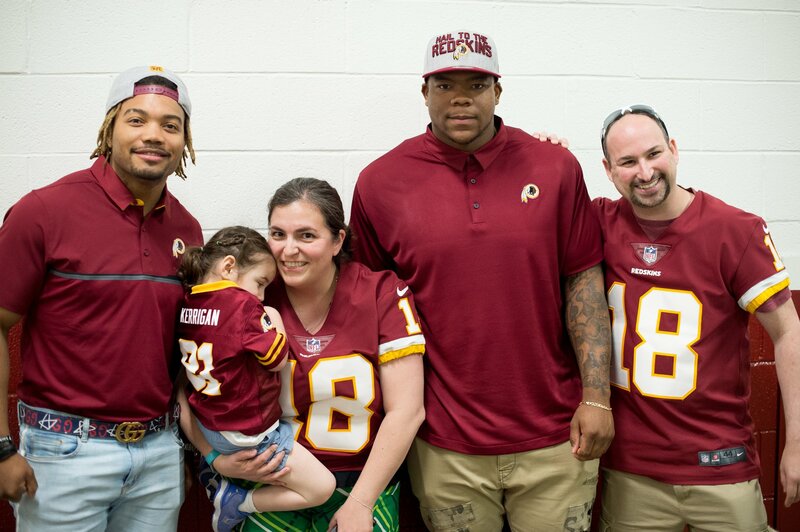 Got to go to Guice and Payne's First Press Conference at Fedex field during the draft day party thanks to the Redskins Rewards program. He was very nice to meet in person. At one point he picked up my daughter, totally didn't get my camera out quick enough. Interesting stats I stumbled across comparing Portis and Guice's college career. If he turns out to be Clinton Portis 2.0 (or better), that's a huge steal for this team.